As Catholics we know and believe as a certain and unshakable truth that the Mass is a sacrifice. Not, of course, that each Mass is a separate sacrifice or that the Mass is a sacrifice other than the one which Christ offered once for all on the Cross; rather, the sacrifice of the Mass is one with that perfect sacrifice of Christ’s flesh, which he offered to his eternal Father. With utmost clarity, Trent taught that the Mass is a sacrifice, against the protestant heresy. The Catechism of the Catholic Church, which is truly the Catechism of Vatican II, likewise insists that the Mass is a sacrifice and one with the Sacrifice of Calvary. Nevertheless, the fact remains that many people (and even some Catholics) deny this truth. Either through direct rejection of this doctrine (as in the case of heretics) or through an implicit and indirect rejection manifested by external actions during the Liturgy (as in the case of countless Catholics and even some priests), many people deny that the Mass is a true sacrifice. However, whatever is at the root of this denial, the problem could perhaps be remedied (at least to a great extent) if more of the faithful knew and understood not merely that the Mass is a sacrifice, but also how the Mass is a sacrifice. For, although a good number of Catholics believe in the sacrificial nature of the Mass, very few indeed are able to explain what makes the Mass to be one with the Cross. Moreover, I would submit that certain prominent ways of understanding the Real Presence (especially among devout Catholics) have led to a serious confusion which has ultimately obscured the sacrificial nature of the Eucharist. Question 574 of the Baltimore Catechism defines a sacrament as follows: “An outward sign instituted by Christ to give grace.” Sacraments are signs, they are figures; but they are not mere signs and figures, for they give a thing, namely they give grace. In order for a sacrament to be a sacrament it must be a twofold reality: It must be an outward or visible sign and it must convey an internal invisible thing (grace). If a given reality is not a sign, or a figure, or a symbol, then it cannot be a sacrament. If a given reality is only a sign, figure, or symbol, then it cannot be a sacrament. The Eucharist is a sacrament. This is a teaching which we hold with divine and Catholic faith. This doctrine was not always held, or at least it was not always expressed in this way. For many of the Fathers in the early Church, the Eucharist was not a mere sacrament, but was more than a sacrament. Hence, though some Church Fathers enumerate even twelve sacraments (and some included more than 300), many did not include the Eucharist in the list. During the Scholastic period, especially through the influence of Peter Lombard, the theology of the sacraments developed and took on a form which is close to that which we hold presently. Uniting the idea of res (thing) and sacramentum (sign or symbol), the Scholastic doctors came to understand that all sacraments are sings which convey grace. Moreover, it became a matter of doctrine that the Eucharist is one of the seven sacraments. Even the Eucharist is a sign and a symbol, though it is not a mere symbol. The Council of Trent regularly refers to the Eucharist as a symbol – it is a symbol of the unity which is to come in heaven. In reaction to the heretical reformers, the notion of “sign” fell into disuse, so as to avoid confusion. Still, the Church continues to maintain that the sacraments are “signs,” though they are certainly not merely signs. That which appears to be bread is the sacrament of Christ’s body. While that which appears to be wine is the sacrament of Christ’s blood. Obviously, we know that Christ is wholly present body, blood, soul, and divinity under both species – whoever receives even the smallest particle of the Sacred Host, receives the whole Christ; and whoever receives even a drop of the Precious Blood, receives the whole Christ. Nevertheless, it is with good reason that, when distributing Communion to the faithful, the priest gives the Host, calling it the Body of Christ; and he gives the chalice, calling what it contains the Blood of Christ. The Host is the sacrament of the Body. The species in the chalice is the sacrament of the Blood. As a matter of faith we must not merely affirm that Christ is present in the Eucharist “really, truly, and substantially,” for we must also confess that the Lord is “sacramentally” present as well. The sacramental presence of Christ in the Eucharist is the foundation of all the others, since if the Eucharist were not a sacrament, Christ would not be present in any manner whatever. In reaction to Protestantism, many in the Church have denied or at least ignored the fundamentally sacramental nature of Christ’s presence in the Eucharist. Often, when reading devout Catholic authors, it seems that speaking of the Real Presence as a sacramental presence is at least of only secondary importance. All too often, the faithful are led immediately into the controversies of transubstantiation verses consubstantiation – a point which is certainly important, but which can only be understood after affirming that the Eucharist is a sacrament. Indeed, we get the impression that any talk of the Eucharist as a “sign” or “symbol” (language which is common not only in the Father’s of the Church, but even in the Scholastic doctors and, to a much diminished degree, the Council of Trent) is immediately suspect of heresy. Some will even start to speak of the Eucharist in highly physical terms, as though the presence of Christ were physical. Here, the real problem lies in the hidden presumption is that, unless a thing is physical, it is not real – hence, it would seem that a sacrament is not really real, if there is no physical change. A citation from Cardinal Ratzinger will suffice to correct this error: “But this [the doctrine of transubstantiation] is not a statement of physics. It has never been asserted that, so to say, nature in a physical sense is being changed. The transformation reaches down to a more profound level. Tradition has it that this is a metaphysical process. Christ lays hold upon what is, from a purely physical viewpoint, bread and wine, in its inmost being, so that it is changed from within and Christ truly gives himself in them. […] [The Eucharist] is not a thing. I don’t receive a piece of Christ. That would indeed be an absurdity.” (God and the World, 408) The future Pope says it with extreme clarity: “From a purely physical viewpoint” the Eucharistic species is “bread and wine” because the change is not to be understood “in a physical sense.” However, on a more profound level, on the level of being and of essence, indeed the level of substance; there is a radical change by which what was once bread and wine now has become the Body and Blood of our Savior. A sacramental reality is just as real (perhaps even more real) than a physical reality. The mere fact that a change is sacramental, does not mean it is not real – no, the most real things this side of heaven are the sacraments! Hence, we need not fear when we state that the Mass is a sacrifice insofar as it is a sacrament. The sacrifice is sacramental. The species of the Host is the sacrament of Christ’s Body, and is substantially Christ’s glorified body. The species contained in the chalice is the sacrament of Christ’s Blood, and is substantially Christ’s glorified blood. However, the Scholastic doctors (notably, St. Thomas Aquinas) go further and state that the glorified body of Christ, substantially present in the Host, is itself a sacrament of another reality: It is the sacrament of Christ’s dead body hanging upon the Cross. Moreover, the glorified and living blood of Christ, substantially present in the chalice, is itself a sacrament of Christ’s dead blood which was poured forth from his lifeless body. 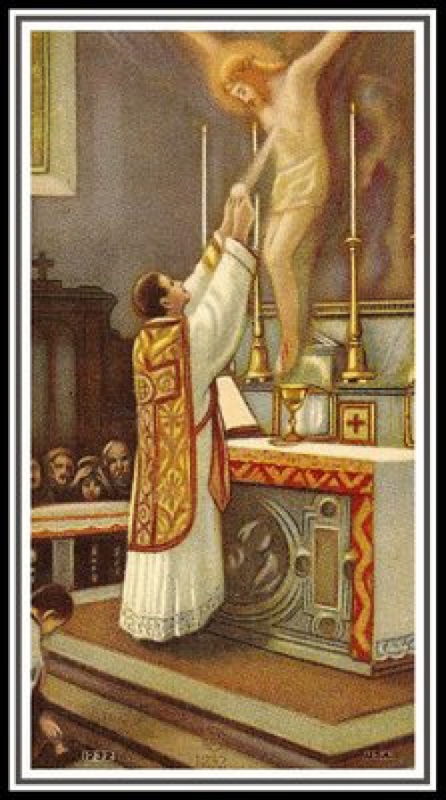 This is how the Mass is a sacrifice: As the body and blood of Christ were separated when he hung dead and pierced through upon the Cross, so too in the Mass the sacrament of Christ’s body and the sacrament of his blood are separated upon the altar. Here we have a sacrament: An outward sign which gives grace. As the bread and wine have become the sacrament of Christ’s body and blood, so too the substantial presence of Christ’s body and blood have become the sacrament of the Cross. The separation of the Host and the chalice is the sacrament of the sacrifice, it is this separation which makes the Mass to be a sacrifice. For a profound (and yet easily approachable) study of this topic, consider “A Key to the Doctrine of the Eucharist,” by Abbot Anscar Vonier and available in a new edition from Zaccheus Press. It should be clear why so many Catholics deny the sacrificial nature of the Mass – it is because they deny the sacramental nature of the Mass. Precisely because so few Catholics (devout and impious alike) have little time or interest in the Eucharist as a sacrament, sign and symbol, many Catholics have lost any notion of the Mass as a sacrifice. If the Eucharist is not a sacrament, neither is it a sacrifice. If we do not believe that a sacramental presence is a real presence, and if we do not accept that a sacrament is real, then we will soon fail to believe that the sacramental sacrifice of the Mass is a real sacrifice. If our whole understanding of the Eucharist is fixed on some notion of physicality, we will have no place for Calvary – for, surely, we are not physically present at Calvary when we attend the Mass. Moreover, if we lose the notion of the Eucharist as a sacrament, we will soon fail to believe in the reality of the other sacraments (since they do not bring about any substantial change). Indeed, this has already begun to happen with sacraments like Marriage and Confession. With regard to the sacraments which bestow a character (namely Baptism, Confirmation, and Holy Order), it is not uncommon to hear certain theologians speak of this character as a “substantial change” – as though the indelible mark were called a “substantial” rather than a “sacramental” character. In modern approaches to the sacraments, all tends to be reduced to "'substantial" changes; and the whole idea of substantial change is reduced to physical change. And it all starts when people begin to say that Christ is physically present in the Eucharist; recall that the Church states he is really, truly, substantially, and sacramentally present, but she has never said he is physically present (though he is present in his physical reality, i.e. dimensive quantity). To recover our faith in the sacraments in general, we must recover our faith in the Eucharist as a sacrament. And there may perhaps be no better way to bring about a renewal in a sacramental understanding of the Eucharist, than to study the sacrificial nature of the Mass. A bit tangential, but what is consubstantiation? I have heard that it is a word (traditional) Lutherans use in relation to the Eucharist, but appart from that, I haven't the slightest idea what it is. Do you know of a decent place where I can read up on that? Also, I've been searching forever for an answer as to why we Romans only receieve under one species. The only answer I ever receieve is that it originated to "combat a heresy". Yet I'm never told which heresy nor when. Can you shed some light on this? Finally, many modern Catholics refer to the Mass as a meal/banquet, and apparently deny the reality of the sacrifice. In reaction to this, many traditional Catholics seem to cringe at the mere mention of the Holy Mass as banquet. Yet this seems to me to be a flase dichotomy. Isn't Holy Mass, in fact a sacrificial banquet? Why do we alientate the two when both are necessary for a fuller understanding of the Mystery? The Divine Liturgy brings us back to Cavalry, but it also projects us forward to the Banquet of the Lamb. this is great! I can relate to everything you've written here. I've heard friends talk about the 'physical change' of the Eucharist ('body = physical' thinking). I've heard the Mass was a sacrifice but never heard it explained. Great work! Following on from your last comments, am I right in thinking that the 'character' sacraments do permanently affect your soul, but that this is not a 'substantial' change for the reason that they don't change your soul into something else? Regarding "substantial change" and "sacramental character" ... you are correct, if the character given in baptism were a "substantial change", that would mean that the child would cease to be human and become something else -- a change in substance (and I suppose that the idea would be that the accidents remain) ... obviously, the idea is ridiculous. Grace (that is, habitual sanctifying grace) is an accidental property inhering in the very essence of the soul. Sacramental character is not a substantial change, but an accidental change. Still, it is real -- it is real not because it is a substance, but because it is a sacrament. Sacramental character is the classic "res et sacramentum". Peace to you, and thanks again for the encouragement! "Consubstantiation" is the absurd idea that the eucharistic species is substantially both the body, blood, soul and divinity of Christ and also bread and wine. As though the two substances co-exist in the single species. Simply put, only a really poor philosopher (like Martin Luther and his followers) could come up with such a silly idea. Far more honest (though still terribly wrong) are the heresies of Calvin and Zwingli. Who claim that the Eucharist is a pure symbol. The reason why, traditionally, the Roman Church receives communion only under one species is rooted mostly in practical ease. It is far easier and also safer to distribute under the single form (the Host). At Trent, there was some talk of distributing the precious blood, but this was rejected on account of the protestant heresy which claimed that the host was only the body and the chalice contained only the blood -- whereas we believe that the whole Jesus is present in both. However, the practice of distributing only the host had originated many centuries before protestantism. Certainly, the two are not opposed. Indeed, each have their own proper place -- certainly, today it is more common to see the "sacrificial nature" denied than the "banquet nature". But you are right, we ought not deny either -- rather, we must affirm both! Somewhat related to the Mass, I recently learned why the Eucharist was called breaking of bread in the Scriptures: Because the Paschal bread represemts manna and redemption and anticipates the New Manna, and because the breaking of bread represents the suffering and liberation of Israel (their backs broken, their bonds broken) and anticipates the Servant of Israel who will suffer and redeem the world. Catechism 1353 "...the power of the Holy Spirit, make sacramentally present under the species of bread and wine Christ's body and blood..."
Catechism 1367 "...the same Christ who offered himself once in a bloody manner on the altar of the cross is contained and is offered in an unbloody manner." Catechism 1376 "...by the consecration of the bread and wine there takes place a change of the whole substance of the bread into the substance of the body of Christ our Lord and of the whole substance of the wine into the substance of his blood. This change the holy Catholic Church has fittingly and properly called transubstantiation." Catechism 1382 "The Mass is at the same time, and inseparably...the sacred banquet of communion with the Lord's body and blood." Catechism 1374 -- "In the most blessed sacrament of the Eucharist "the body and blood, together with the soul and divinity, of our Lord Jesus Christ and, therefore, the whole Christ is truly, really, and substantially contained." Catechism 1381 - " ...St. Cyril says: 'Do not doubt whether this is true, but rather receive the words of the Savior in faith, for since he is the truth, he cannot lie.'" It's Jesus physically and in every sense. Thank you for this wonderful post. I have tried to bring additional points to your post here. His premise (in a nut shell) is that while the churches of Ss. Cyprian, Dionysius, Basil, and Jerome communicated under one kind, we may not know all the circumstances that led to that discipline: "It is therefore not safe in us, because it was safe in them." He illustrates examples of 'double communion' from the same era, even communion just from the Chalice! What makes all these disciplines 'safe' for the faithful is the same now as it was then - the authority of the Church. "It is safer to acquiesce with, than without, an authority." It's a short chapter, and worth a read. Thank you for all those great quotations from the Catechism! I hope you will take the time to re-read them, as it is quite clear that Jesus is sacramentally, substantially, really and trully presenst -- but NEVER has the Church said he is "physically" present. Not a single one of your quotations uses the word "physical". In the future, please leave some sort of tag or id ... I may not publish anonymous comments. Regarding the concept of real presence, in an attempt to grasp this fully, are either of the following assertions gross oversimplification? First assertion: For me, the real presence I truly experience, currently, in the Eucharist is the same real presence the Apostles truly experienced in Jesus' real, true, yet glorified presence on earth after his resurrection? Second assertion: When Jesus walked the earth in true physical human form, the trouble was not understanding His true physical nature, but His truly divine nature. In contrast, (vise versa) now that Jesus no longer walks the earth in in true physical human form, but is truly present in a divine Eucharistic form, the trouble is understanding His true glorified physical presence? 1) Yes, the real presence of Jesus in the Eucharist is the same Jesus, who was truly present with the Apostles. Then, he was present in his proper species; now, he is present on earth in his sacramental species -- but both are real, true, and substantial. 2) You make a good point about accepting the divinity and how this is more difficult than any physical recognition. However, I wouldn't want to connect his humanity exclusively with physically ... even under the sacrament, Christ's entire humanity is present (glorified, but not physical). Not to complicate the matters too much, but I would like to share a little quote from Mysterium Fidei (by Paul VI) -- taken from paragraph 46. In the Eucharist "Christ is present whole and entire in His physical "reality," corporeally present, although not in the manner in which bodies are in a place." Here, the Holy Father refers to what Thomists call "dimensive" quantity. Christ's body is present. The physical reality of his body is present. It is even "corporeally" present. But it is not physically present -- hence the Pope states that it is not after the manner "in which bodies are in a place". What a great discussion! I feel a lot of mental rust being knocked loose as my brain clatters into operation. Could you elaborate on the meaning of Christ being corporeally present, with "dimensive" quantity, and yet not being physically present? Father, God reward you for this! It is a wonderful article. You wrote: "At Trent, there was some talk of distributing the precious blood, but this was rejected on account of the protestant heresy which claimed that the host was only the body and the chalice contained only the blood -- whereas we believe that the whole Jesus is present in both." Unfortunately, this heresy is becoming widespread again on account of receiving under both Species. The Roman practice of receiving under one kind pre-dates the heresy to which you're referring (utraquism, "both kinds"). The Council of Trent confirmed the current discipline because (among other things) to change it would have been most imprudent given the Protestant insistence upon receiving under both kinds. The reason for the withdrawal of the Chalice from the main body of the faithful had to do with practical matters -- concerns over spilling the Precious Blood, for example. As a side note -- and I hasten to say these are just my observations, not actual data -- I have noticed a certain revival of utraquism since the Chalice is more readily available to the faithful. DCS, today I learned something new: "utraquism". I did some research on it. The point about "dimensive quantity" is very technical ... but I will try to expain it in a simple manner (briefly). The dimensive quantity of Christ's body (i.e. its physicality, specifically its size) is present in the Eucharist. However, this is present not by virtue of the "power of the sacrament" but by "real concomitence." In other words, what is present is the body of Christ. However, because the body of Christ is spacial, so too these spacial properties are really and truly present in the sacrament. However, we cannot say that Christ's body maintains the dimensive quantities after the manner of his proper species -- for the host is not physically the size of the body of Christ. Nevertheless, these properties are present after the manner of a sacrament (by concomitence), and this is real and true -- but it is not physical. Hence, we say that there is a "bodily" or "corporeal" presence -- because his body is truly and really and substantially present. But we do not say it is a "physical" presence, because the host is not the size of Christ's body! Thanks for the great question. I hope this helps some. I realize that Jesus is present, whole and entire, under both species, therefore, reception of both species is not necessary. I have another question in lieu of 'Anonymous Veronica' and dcs's comments. Why then does the priest break off a small piece of the Host and place it in the chalice after consecration? -- The co-mingling symbolizes the inebriation of heaven. Regarding communion under both forms: It is a fuller sign to receive both species. One could even say it is more perfect. Indeed, Fr. Garrigou-Lagrange (following St. Alphonsus) holds that a man can legitimately desire the priesthood in part because of the honor of receiving under both species. More grace is given when receiving under both species. Still, all that being said, the heresy which dcs and Veronica have discussed is indeed prevalent in our day -- and must be avoided. Hence, there is indeed good reason to (perhaps) consider limiting the distribution of the chalice. Shazam! The temple veil is torn asunder, the three bodies (churches) unite, symbolism and allegory unlock, the Trinity explodes. Passion Sunday indeed. Thanks! "...NEVER has the Church said he is "physically" present." Again, Catechism 1374 says: Catechism 1374 -- "In the most blessed sacrament of the Eucharist "the body and blood, together with the soul and divinity, of our Lord Jesus Christ and, therefore, the WHOLE Christ is truly, really, and substantially contained." Are suggesting that the "whole" excludes the physical? That is a contradiction. You are extremely discourteous ... leaving an anoymous comment after I had very clearly asked you to at least place some sort of tag or pseudonym at the end of your comment. On this account, you do not deserve a response. However, I am feeling particularly generous...so I will respond briefly. ... CCC 1374: "truly, really, and substantially" ... never, never, never has the Church said "PHYSICALLY" ... what about that can't you understand. As I said above, the body of Christ is present in its "physical reality", but it is not "physically present" ... it is sacramentally present. Are you one of those people who think that a thing is not real if it is not physical? In any case ... Do you think the Trent commits heresy when claiming that the Sacrifice of the Mass is "unbloody"? After all...the Blood of Christ is offered ... how could it be an "unbloody sacrifice"? There is only one way it is possible: The Blood of Christ is sacramentally present, and hence is unbloody! If it were physically present, the sacrifice would be bloody indeed; but it is sacramentally present and therefore the sacrifice is an unbloody sacramental sacrifice. So yes, I am saying that Christ is wholly present but not physically present. And no, this is not a contradiction. Reginald - I did not mean to offend you by not signing my comment. I unintentionally neglected to do so. This one is signed. "...never, never, never has the Church said "PHYSICALLY" ... what about that can't you understand." I understand it perfectly. The Church did not need to specify physical because it already describe it as "whole", which includes it. "Are you one of those people who think that a thing is not real if it is not physical?" "Do you think the Trent commits heresy when claiming that the Sacrifice of the Mass is 'unbloody'"
No. It is unbloody and yet the physical blood is present but hidden. There is much that is hidden from the human senses that is nevertheless physical. For example,humans cannot see atoms or hear sounds that are perceptible to dogs. "The Blood of Christ is sacramentally present, and hence is unbloody!" The fact that it is sacramental means that it is sacred, holy, that is, of God. It has nothing to do with whether it is bloody or not. 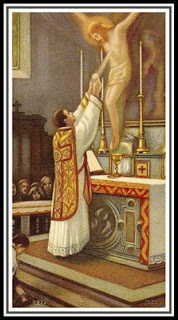 Catechism 1116 "Sacraments are "powers that comes forth" from the Body of Christ, which is ever-living and life-giving. They are actions of the Holy Spirit at work in his Body, the Church. They are "the masterworks of God" in the new and everlasting covenant." I hope this better helps you and others understand my understanding of the Catholic faith. Ok, now we are getting somewhere! I'm glad you are willing to continue the discussion, I know that I can be a bit short in my responses sometimes. I think that you think that I am denying that the body and blood of Christ are present in their physical reality. Truly, I am not denying this! Rather, I insist that the physical body and blood of Christ are sacramentally present. They are not physically present, (though they are physical ... by virtue of dimensive quantity) ... yet they are truly and really and wholly present by virtue of the sacrament. Hence, they are sacramentally present. You reduce "sacramental" to meaning "sacred, holy, of God" ... in this you err greatly, for many things are sacred, holy and of God, but are not sacraments. What makes a thing to be a sacrament is that it is a sacred sign instituted by Christ to give grace. Did you catch that: A sacred SIGN. The sacrament is both sign and reality -- this is what makes the sacramental species of Christ's body in the Eucharist differ from the proper species of Christ's body in heaven. If Christ's body were physcially present, then when the host was broken, Christ's body would be broken and divided. However, the physical body of Christ is sacramentally present ... and the sacramental presence is not divided or broken even when the host is divided and broken. If the blood of Christ were physically present, then the Eucharist would be bloody. However, the blood of Christ is sacramentally present, therefore it is unbloody. CCC 1367 states that the only difference between the sacrifice of the Cross and that of the Mass is that "the manner of the offering is different" ... and what is different about the "manner of offering"? On Calvary, Christ was offered physically; but in the Mass Christ is offered sacramentally. The Church teaches that the "whole Christ" is present ... but she does not teach that Christ is physically present. You should be able to recognize that "whole" is a noun, while "physically" is an adverb. Thus, "whole" cannot mean "physically" ... they are not even the same part of speech! Likewise, though the "blood" of Christ is present, it is not a "bloody" presence. Can you see the difference between the parts of speech? Thus, though there is a certain sense in which we say that the physical body of Christ is present, we do not say it is "physically" present. I hope you can see this. I am willing to continue further discussion of the topic ... but please do not accuse me of heresy or of denying the Catechism. ...with all the Eucharistic heresies out there, I am certain that, if the Church wanted us to believe that Christ is physically present or "present in every sense of the word" then she would have taught this... But she has not taught this, and St. Thomas Aquinas has explicitly taught against this (namely, he has taught that Christ is not locally present, hence he is not present "in every sense"). Thank you for this post. Rather a lot to think about, most of which is over my head (I studied law and politics, not theology and philosophy!). I hope you will give a little guidance on a question that has been nagging at me. With respect to purely physical things (for example, bread), I have difficulty seeing the difference between the categories of "substance" and "accident." How are they not the same thing for physical objects? As I see it (and I'm willing to be educated), a rock "is" (has the substance of) a rock because it has the physical properties (accidents) of rock; bread "is" bread because it has the physical properties of bread. The primary difficulty I see with this, though, is that it conceivably leads to consubstantiation, not transubstantiation. Since that's heresy, I must be lacking some understanding. Sorry if this post is rambling or seems incomplete - again, I'm not a philosopher or theologian, and have never studied Aquinas (more like skimmed). I would greatly appreciate any enlightenment you could provide. You ask a good question: What really is the difference between substance and accident? The easiest way to come to understand is to think about change. When a thing changes, but remains the same essential thing -- we say an accidental property has changed. Examples of this: Motion, growth, decay, breaking bread, pouring wine. However, accidents are not always physical: Learning and gaining knowledge is an accidental change in the soul, so is grace, virtue and vice. When a thing changes and does not remain the same thing -- this is a substantial change. Examples: Death, burning wood into ashes, digestion of food. So, bread "is" bread, not really so much because of physical properties -- because many of these change (like size, location, dampness, etc). Rather, we say that bread has the physical properties because it is bread -- do you see that: we reverse the statement. This is what is so mysterious about the Eucharist: The host is Jesus, but does not have the physical properties of Jesus. However, this does not cause a problem because the physical properties (like all accidental properties) do not make a thing to be what it is. The main thing I would say to you is to recognize that it is not the physical properties that make a thing to be what it is; rather, the fact that a thing is what it is makes it also to have those physical properties (usually). Hence, though the accidents of bread and wine remain, the substance is totally and completely changed to Body and Blood. And this is a sacramental change (in addition to being real, true, and substantial), so the change does not affect the physical properties. Can we get some help as to the names of the early Church fathers that enumerated twelve sacraments (and some, more than 300)? St. Peter Damian held that there were 12 sacraments -- and he is a Doctor of the Church! Hugh of St. Victor held for more than 300 (not a saint, but he is one of the great theologians of the early scholastic period). Often, the Eucharist was not included in the early days (it was considered a super-sacrament). But monastic vows and the coronation of kings was, as well as the consecration of a church. I also admit that most of this discussion is beyond the intelligence Our Lord deemed best for me to have, but, nevertheless, I have found the discussion fascinating, and I look upon the Tabernacle now with eyes full of new wonder at the "Mystery" within. If this topic boggled the mind of St. Thomas Aquinas (and his good, good friend Bonaventure [isn't that touching that Our Lord would have provided such a kindred soul for him? ]), I won't even touch it. I just want to say thank you, Reginaldus, for this fine article. I found it most instructive and edifying. I also appreciate the recommendation of Abbot Vonier's book, which I've added to my (ever-growing, if not completely out of control) list of must-reads. Dear Father. I just re-read this today and I think it is smashing. You made the complex understandable. Kudos. In the section on "The Eucharist" (page 233 in my TAN Books volume) we read: "Here the pastor should explain that in this Sacrament are contained not only the true body of Christ and all the constituents of a true body, such as bones and sinews, but also Christ whole and entire." I know that has been quoted out of context and emailed around by certain soi disant traditionalists without also noting, as you did in your excellent piece, what a Sacramental presence entails and what it excludes - a literal physical presence. Thank you for the additional info! Yes, it is not a literal physical presence, but a literal sacramental presence! -- I can see how someone might get confused by the quote from Trent, if they don't understand the theology of Trent which motivates the quote. Also, I did get the 'test' email -- so you can feel free to send your question (or post it as a comment on the page, Ask Reginaldus). I was hoping for a response so I could send you a question that is too long to post in here. I was also trying to remember the time in the Church (Mani and his followers?) when we only allowed Communion in the Sacred Species, wine, so as to weed-out the heretics who considered wine evil. No one may read this because this post is kind of old at this point, but just a though I had during the Triduum in the Old Rite this year concerning rationalism and the Eucharist. Our modern rationalistic tendencies have told us to turn the altars around so that the people can 'see' what happens at Mass. The precise point is, however, that we cannot see the bread and the wine change. Mass must be celebrated mystically not because it is irrational, but because it is only through the mystery that we can grasp the Reality. Facing East, the genuflections, the bells, the smoke, the silence of the Canon...those mysterious, but very human gestures help us, the faithful, help us to grasp with a faith-filled reason, that God has descended upon the Altar. Here's how I understand the belief that in receiving either species of the Blessed Sacrament, we receive the entire Christ: Body, Blood, Soul and Divinty (Concommitance). It's linked to belief in the Real (ie. living) Presence of Jesus in the Blessed Sacrament. Just as a Body cannot live with containing blood, so with the Host. It comprises both Body and Blood. Otherwise the body is merely a dead corpse. Similarly, blood needs to be contained in a body if it is to live (for any length of time) - otherwise it is just dead blood. So, in receiving either species of the Blessed Sacrament, we are receiving the entire and living Jesus. There is a sense in which receiving Holy Communion under both kinds is receiving the Lord twice: the rubrics of the Ordinary Form Missale Romanum allude to this when it is noted that it is the sign value of the Eucharistic Meal to the Heavenly Banquet, not the essence of Holy Communion, that is enriched by this double reception[n.135]. As has already been mentioned, the Mass is a sacrifice since it continues the one sacrifice of Jesus on the Cross. Just as on Calvary, the Body and Blood of Jesus were separated, so in the Sacrifice of the Mass Bread and Wine are consecrated separately for the purpose of renewing the one sacrifice of Jesus. If the Protestant Heretics had understood this teaching properly, they would not have found anything objectionable about the Catholic teaching on the Sacrifice of the Mass. It is from the Sacrifice of Christ renewed in the Sacrifice of the Mass that all the other communion/banquet/meal themes emerge. But in that order: Sacrifice then Communion. You can't have one without the other. Thank you for the comment, it is very good on almost every point. You are correct that, for it to be a living presence, Christ's body and blood must be united (through real concomitance) ... however, it is not true that it would not be a real presence without both body and blood being united. They are united in the sacrament because they are currently united in the proper species (Christ living and glorified in heaven) ... however, if the host had been kept in a pix on Holy Saturday, it would have really and truly been the body of Christ (and his divinity); but it would not have been his soul or his blood. The one is the sacrament of his body, the other is the sacrament of his blood -- this is the foundation both for the sacrifice and for communion under both kinds. Fr. you have certainly helped me here, but I don't think it's quite as simple as you have made out. i think that ex-anonymous and the political scientist have brought out some of the difficulty. I'll see if i can help explain. I think the problem has to do with 'physical' and 'presence.' The political scientist said that an essence of a thing is what the thing is. What is the essence of a quartz rock? Does it have a real essence outside of its normal existence? is there a platonic form of quartz rock, or of the particular fragment x of quartz rock, that exists in the mind of God, for instance? I think it must be admitted that the philosophy of accidents and essences evolved primarily to explain that type of thing. Then the church took up this form of philosophy, and, as it did with many things, changed it in light of Christ. When we say Christ is substantially present it is not crazy to say that He is also physically present because He is God. But it doesn't make any sense to say that a quartz rock is substantially present through a sacramental means. We could not produce a sacramental presence of Quartz if we were high priests to the Quartz god. So it is very strange to the mind to consider that a thing can be substantially present, and yet not physically present, since everything else in the universe which is substantially present is also physically present. N'est pas? What body in the universe could possibly be substantially present, yet not physically present at the same time? Only God's body could do this. Saying that nevertheless Christ's body is really present, merely explains an absurdity with a mystery. It is a mystery we may be sure of if the Church teaches it, but it is a mystery nonteheless. Now to the second point. Ex-anonymous i think has latched on to something and i think it is this: since Christ is already present everywhere in the universe, what would be the point of His becoming sacramentally present in our physical presences while we are attending mass? In other words why attend mass? If He is not physically present at mass, and we can find Him anywhere we go anyway, why do we need to be physically near His presence? Or put another way, if our physical presence is important to experiencing Him, why is it sufficient for Him to be substantially present but not physically present? Since He is really present but not physically present, why doesn't His real presence at mass fill the entire earth and obviate our need to attend the sacrifice in order to receive His grace? Now I know there must be a reason because He said to do it. But i can't explain the reason based on these metaphysical explanations. He must have had another reason to command us to be there. OK, i hope i'm not too way off here. We have to recognize that the sacraments are different from everything else in physical reality -- hence, we will not get too far by comparing the Eucharist to other elements in the natural world. This is precisely what makes the Eucharist to be the Eucharist ... it is not a natural presence, but a sacramental presence. However, it is certainly important to stress that we receive Christ in a most precious way when we physically receive the Eucharist. This is what makes the Eucharistic presence so special -- There, he is substantially present. However, even in the reception of communion we must be careful: When I physically receive and consume the Eucharist; I do not so much receive and consume Christ, as I am received into his mystical Body. Christ does not become a part of me, but I am incorporated into Christ. How different this is from physical reality ... he have here a sacramental reality! Fr., you say 'We have to recognize that the sacraments are different from everything else in physical reality.' I agree of course. I was attempting to point out that the reason the presence of Christ in the eucharist is difficult to comprehend is that it is explained using a philosophy which was invented precisely to explain physical reality. First, the church adopts the philosophy of accidents and essences, which explains change and constancy by proposing that the essence of a thing does not change; what changes are rather its accidents. This philosophy predated modern physics. We now say that what makes a quartz rock is a particular molecule crystallized in a particular manner. That is the 'essence' of a quartz crystal, the thing that makes quartz quartz, despite breaking a quartz rock into little pieces, for instance. Prior to modern physics there was some idea of the thing which existed in some manner which was proposed to be the ideal form of the thing. So, next, the church takes this idea and applies it to the transformation which occurs at mass: the substance of the bread and wine has become completely Jesus Christ, but it 'appears' to be bread and wine. Bread and wine is just appearance, just an accident. But if you take the bread and wine and take a look at them closely, except when a eucharistic miracle has occurred, you see the molecules that make up bread and wine. It is not that what are traditionally thought of as accidents relating to the bread have changed. On the contrary: from the moment before the words are spoken, until the moment after, nothing seems to have changed accidentally at all. Furthermore, there seems to be an equivocation occurring here in that now ‘accident’ has taken on the meaning ‘appearance.’ But that is not what the old philosophers meant at all when they spoke of accidents. Next the church says, ‘but this is different. The physical bread and wine remain, but the actual presence of Christ is what is really present.’ After saying this it is hardly to be wondered at that consubstantiation remains a temptation. If the physical presence of the bread and wine remain, how can it be reasonably said that the bread and wine are nevertheless not really present, and that Christ is all that is really present, albeit not physically present? It would seem to be easier to believe that both Christ and the elements are really present: the elements through their natural means, and Christ supernaturally, sort of as an added invisible ingredient in the mix. The old philosophers did not know what made a thing what it is. We know. We found out by looking more closely at the thing than they could. That would seem to obviate the need for their philosophy. But the church says, ‘no; we can admit that they were wrong about physical things, in fact that is none of our business; nevertheless we will use their defunct philosophy to explain heavenly things.’ But the modern mind looks at the thing which it understands in the modern way [bread is really bread b/c of molecular composition], while the church explains the thing using a philosophy which doesn’t recognize what really makes bread, bread. You chastised anonymous for believing that what is really present must also be physically present. But that is the case for everything in the universe, except God. Well that is the best I can do for now. I hope it is a step in the right direction. Your criticism is welcome. Second, it is clear to me that you do not really know what Aristotle claimed about physics or about metaphysics ... you are confusing him at times with certain aspects of Plato -- esp. at times it is as though you think that Thomas/Aristotle held that there was really some "ideal form" of a thing existing in some "form heaven" ... This is simply not true. Third, You are likewise mistaken about the historical development of physics ... the fact is that the ancient (not to mention the medievals) were far more scientifically sophisticated than you give them credit for. Lastly, (since it bears directly on the question of transubstantiation), it is simply not the case that the Church uses "accidents" to refer only to "appearance" ... St. Thomas holds that, in the case of a Eucharistic Miracle (as when the Host has physically changed to look like flesh) that the essential accidental properties remain unchanged -- namely, dimensive quantity (which is not about appearance). Likewise, on another subject, knowledge of a particular thing is an accident in the intellect which has nothing to do with how the intellect "appears". Finally, there is much more in the Universe that is present without being physically present than simply the Eucharist and God ... I am thinking of the angels. And there are almost certainly innumerably more angels than there are physical beings ... hence, your final claim is manifestly false. I'm sorry ... I just don't have time to enter into this debate any further ... and, though I welcome your comments, I really do not think that they are in any way "a step in the right direction" ... you simply are confused about the history of physics and metaphysics as well as about the theory of these two sciences. Ok, thanks for your comments Fr. Probably no need to post this if you don't want to continue the discussion. Thanks for the link to the discussion with disputationist as well. First, no doubt you are right that I spoke about accidents and essences generally and not specifically in reference to Aristotle’s rendition of the philosophy, but I thought it unnecessary to distinguish him from Plato for the purposes of this discussion. Although St Thomas uses Aristotle, that doesn’t mean that Aristotle owns the idea or invented it. But probably it would have been better if I had discussed only Aristotle, since that is who St Thomas uses. Secondly, as to the sophistication of the ancients, for all their cleverness which I do not dispute, I do think that modern science has given us the ability to understand some things better than they did. Third, I never said that the church only or always uses accidents in the sense of referring to appearance. Rather I said that it expands the general concept of accidents to refer to the mere appearance of the bread which has not undergone any physical change. Is the substance of water when it is liquid, solid, or gas, anything other than the molecule H2O? If it is, please tell me what. These types of changes are what the ancients observed, and in order to explain them came up with the idea of accidents and essences. HOWEVER, WE KNOW TODAY THAT THE MYSTERY UNDERLYING THE ‘FORM’ OF A THING IS RESOLVED BY REFERENCE TO A PHYSICAL, NOT A METAPHYSICAL, REALITY. Did Aristotle teach otherwise than that the form of a thing was a metaphysical rather than a physical reality? I don’t seem to recall that he did. If this underlying assumption of his is incorrect, then the philosophy explaining transubstantiation would seem to be in a pickle. I think that you are reifying a philosophical theory which did not drop down from heaven but was really an invention of man’s mind. If it is confusing to us, given what we now understand about physical reality, perhaps more effort should be invested in finding a better philosophical vehicle to explain the reality we presently attempt to signify by the concept of transubstantiation. I just don’t see the point of loyalty to the old way of thinking. It is confusing and based on ideas of physical reality which we no longer understand to be true. Lastly, to say that also angels can be really present yet not physically present really makes my point. I will concede that we add angels to the list. That does not affect the substance of what I wrote. Actually it confirms it, since the philosophy wasn’t made to explain angelic presence any more than it was made to explain divine presence. So I am saddened that you didn’t take a more charitable reading of that point and said that it was ‘manifestly false.’ Certainly you could see that I was discussing physical reality and contrasting it to divine reality. I was privileged to worship Christ tonight at an exposition of the Most Blessed Sacrament and I have no problem believing, thanks to God, that Godhead indeed lay there in hiding masked by these bare shadows, shape and nothing more…and that seeing touching tasting are in Him deceived. But if I think about the philosophy behind it I do indeed begin to wonder. So perhaps I am just confused as you said and must take it on faith. I will if that is the best I can do. I am sorry if my previous posts seem a bit harsh -- I am only trying to write clearly and directly. 1) You distinguish between "physical reality" and "divine reality" -- this is precisely why I came on so strong about the angels ... you seem to think that anything that is not physical is Divine (i.e. is God) ... but this is not the case ... the proper distinction is between created being (i.e. creatures) and uncreated being (i.e. the Creator, God). Among creatures, we then distinguish between material and immaterial. And most creatures are immaterial ... hence it is simply false what you keep saying: "Divine reality alone is immaterial." 2) The reason that I am so emphatic about (1) is that you are becoming a materialist in the rest of your argument ... acting as though what made bread to be bread were simply the chemical arrangement ... is this also what makes a tree to be a tree and a man to be a man? 3) As I argued in the comment box of the other article I have pointed to above .... bread is not explained by simply pointing to molecules ... I will ask "Why are the molecules like that?" ... you say "They just are that way?" ... then I say "Can they change?" ... and you say "Yes" ... I say, "If they can change, then they are not 'just that way' because they are not necessary" ... then you say, "They just are that way, and they can just change" ... then I say, "What you mean to say is that there is a immaterial form which makes them to be that way and that the form is not identical with the matter and hence the form can change while the matter remains." ... and at this point you should say, "Oh, I guess Aristotle makes sense after all!" Father. Thank you for this post and thank you for your comments and responses. In one of comments you said that if we put the sacred Host in the pyx on the Holy Saturday it would be only Christ's Body and Divinity. What would be of sacred Wine? Would it be only Christs Blood? What would it be? How in the Mass is Christ in the state of victim? Is it because of the sacramental separation? Is it a real separation(I think it is because the sacrifice of the Mass is real)? Could you explain me more what is contained under each of sacramental species? You know...It is Christ's Body but....etc. 1) On the First Holy Saturday, when Christ was in the tomb, the species of the Blood would indeed have only been Christ's non-glorified Blood and his divinity ... it would not have been united to his soul or to his Body. 2) Yes, Christ is truly and really and sacramentally in the state of a victim upon the altar. It is a real sacrifice and therefore it is also a real separation -- the sacrament of the Body is really and truly and sacramentally (though not substantially) separated from the sacrament of the Blood. So, yes, the sacrifice is real -- real because it is sacramental. 3) So, at every Mass now, under both species, the Body, Blood, Soul and Divinity of Jesus is present -- the Body and Blood (and perhaps also the soul) are sacramentally present, really and truly present, substantially present. The divinity is also really truly and sacramentally present -- perhaps also substantially, but I would need to think that through a bit more. Thank you fr. Ryan. In the meantime i ran into another article, namely "If the whole Christ is present under both species of the Eucharist, why do we say "The Body of Christ" and "The Blood of Christ"?" so things became much clearer to me. Thank you for this article. It definitely got me thinking. I'm converting from evangelicalism and am doing RCIA right now. I thought that when people receive the Eucharist host, they are eating Jesus' body, blood, soul and divinity. Can you explain what the difference is between substantially present and physically present? I read all the other comments above but I don't understand the difference. Also, in various Catholic sources, I've heard that attending Mass is like being at Calvary. I've also heard that the Mass is a tapping into the continual offering of the Son to the Father in heaven, as Jesus is a high priest forever. Can please you explain if these views are true, and if not, why they aren't. Let me say what I understand and tell me if I got it right. The reason for Christ's sacrifice on the cross was to reconcile man to God, as atonement for sin, to open the gates of heaven. The reason for Christ's sacrifice in the Mass is to grant us grace, to share his presence in a special way with us, but not to forgive sins as such. (In fact, communicants are meant to be free of mortal sin in order to receive). This is my understanding, but have I got it right? Please advise. If the mass is a real sacrifice, and Christ is dead, how is His body resurrected before it is distributed to the people. The risen body of Christ is a sacrament of the dead body of Christ which is offered in sacrifice. Hence, Jesus does not die again, nor is he raised again. A real, true, sacramental sacrifice is offered.